Eradicate the dreaded droop with these ingenious, adjustable collar stays. There are buttoned up white collar guys, laid-back blue collar guys, and even guys who get hot under the collar… but flimsy, floppy collar guys? No way. Eradicate the dreaded droop with these ingenious, adjustable collar stays. 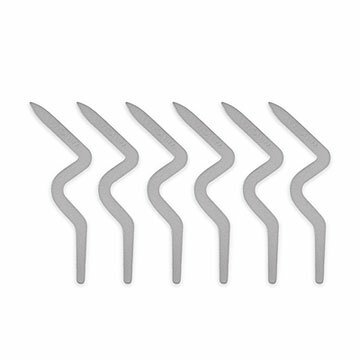 Unlike traditional plastic, metal, or magnetic strips, the reinforcing shape and flexible aluminum construction of these stays lets you sculpt the contours of your collar for a precisely spiffy look. The set of three pairs makes a great gift for dress shirt dads and dapper groomsmen. Made in China. Remove before garments are washed or dry cleaned. This is a very good product. Works great. Collar stays put. No sagging along the placket.In the past i have used other products this work the best.